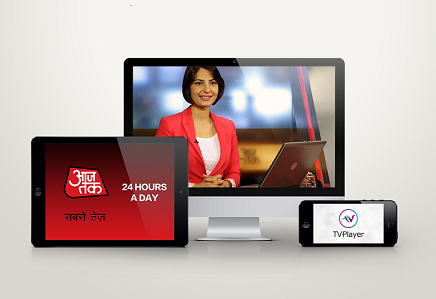 Aaj Tak, the number one Hindi News channel in India, is the latest channel to join the DESI pack on mobile and desktop internet streaming service TVPlayer. Aaj Tak was launched in India in December 2000 as a 24-hour Hindi News channel. Within 6 months of its launch, Aaj Tak became India’s number one news channel. Beginning with an impressive connectivity of 5.2 million homes when launched, Aaj Tak today boasts of a reach of over 50 million homes and a channel share of more than 55% among the news channels.